Every prisoner is quoted in his own words, however all last names have been omitted to shield the privacy and security of each. It’s been 173 Christmas Eves since Scrooge shooed from his office two gentlemen seeking charitable contributions for the poor and destitute, dismissing their request with a pointed question, “Are there no prisons?” Indeed, Scrooge was told, there were, in fact, plenty of prisons. Plenty of prisons then, and plenty of prisons now. America has more prisons than any country in the world, which is why millions of Americans will spend December 25, 2016, in one of more than 6,000 correctional facilities. In our society, what began as a religious holiday has morphed into a ubiquitous season. What happens when Christmas is stripped of all the extra poundage it has put on through the years―when it’s down to the barest of bones? To find out, I visited maximum-, medium-, and minimum-security Indiana prisons and asked men who live there to describe what it is like to be behind bars at Christmastime. What was Christmas Past like for these prisoners? In fact, there are three main strategies for surviving Christmas in prison. One is doing what Leonard recommends: not internalizing. The second is faith. The most powerful is family. Joseph, 22, will also be relying on this coping mechanism to get through his third Christmas behind bars. For Joseph, it’s one day at a time, forget the past, work toward the future. Hopefully, Joseph’s conviction of battery and neglect will halt the generational cycle of abuse he experienced in his dysfunctional home. Surrounded by family members who were addicted to alcohol and drugs, Joseph was subjected to physical abuse up to and including his teen years. Tired of the beatings and angry at the world, he remembers thinking, “I’ll just give up on me,” and dropped out of school. In 2014, Joseph became father to a son whose name and baby footprint are tattooed on his arm. One night when the baby was in his care, he blacked out on Zanax. He remembers nothing until the next day when he woke up in Marin County jail. At the age of 20, then, he was locked up and began the long journey to sobriety. Astonishingly, Joseph does not attempt to pass the buck by blaming his father. “It’s not his fault I became someone who was mouthy and wild when intoxicated.” Joseph is working hard to stay off cigarettes, hootch, and drugs and has been sober for one year and one month. He is counting on the skills he is learning in Westville Correctional Facility’s PLUS (Purposeful Living Units Serve) Program, a faith and character-based re-entry educational initiative, to help him break the cycle that derailed his life. Raised by a mother who is bipolar, Eric never knew what to expect at Christmas. “One year hopefully we got heat. Another year hopefully we got X Box.” At the age of 18, Eric was convicted of armed robbery and sentenced to 30 years. “They waived me over as an adult,” he says, “trying to make an example out of me. I feel like since it was my first time in handcuffs it was too much. I feel like I should have gotten into trouble but I shouldn’t have gotten 30 years. 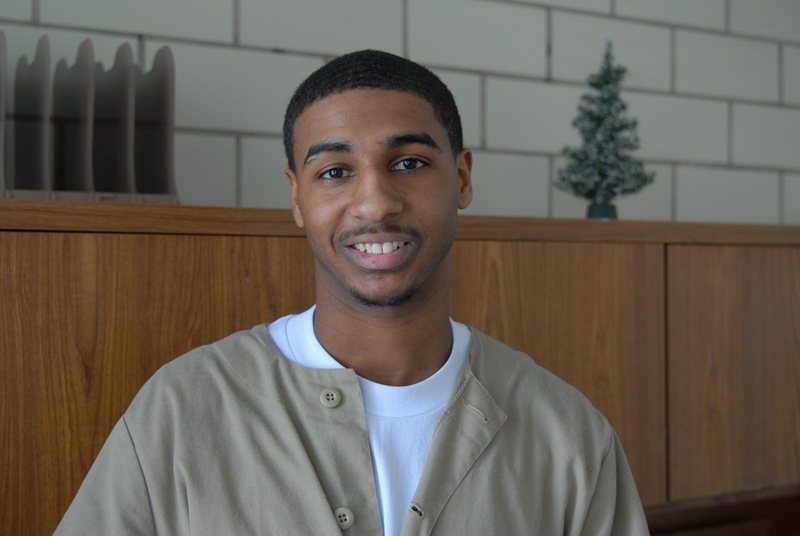 I was still in high school.” His first Christmas in prison was the worst day in his life. “I couldn’t even talk to my mom.” Despite all of that, Eric shoulders responsibility, something he credits to the PLUS Program. And yet, despite the wisdom of moving forward, others argue that there is value in looking back. Brandan provides a cogent example. Brandan was 18 and high on drugs when life as he knew it ended. Convicted of manslaughter and sentenced to 35 years, this is Brandan’s sixth Christmas behind bars. Growing up in Gary, Indiana, Brandan noticed that tourists coming to see Michael Jackson’s birth home were too frightened of the environment to come outside their cars—“That’s what it’s like where I grew up.” When his mother was diagnosed with lupus and her food stamps were cut by ten dollars a month, Brandan wanted to help. He filled out applications for jobs but was not hired. He didn’t see any point in seeking help from anyone at Theodore Roosevelt High. “The 600 kids, principals, counselors, teachers―they’re all in the same predicament I am. I didn’t see anything else I could do to help my mother. The first time I go to rob someone…” Two weeks before Christmas Brandan killed somebody’s son, somebody’s husband, somebody’s father. When I asked the prisoners what sustains them, two words repeatedly rang like bell chimes: faith, and family. For the faithful, the birth of Jesus makes all the difference to their existence. Even in prison, Christmas is a time of joy and hope. Three testimonies in particular speak to this. Prisoners know all about the inside. And they yearn for what’s on the outside. If there were such a thing as a magic wand, each and every prisoner I met would have used it to remove himself from inside and connect to loved ones on the outside. It seems to me that the bell that rings inside the hearts of us all, young and old, believers and non-, free and incarcerated, is the memory bell of family. Even—perhaps especially―in prison, where there is so little to muddy it, the Christmas message is magnified. In prison, those who have almost nothing find inspiration in one holy infant whose birth refocused the world by shining a light upon the sacred bond that is family.